Policy is taking center stage in D.C.’s hottest and vibrant U Street neighborhood; emerging as one of the most highly anticipated restaurants to hit the area. The “upscale diner motif” like downstairs, Love Dining Room and the airy second floor, the Liberty Lounge, this space offers the sentiment of being free and savvy. Decorated with brilliant chandeliers and art work by Andrew Funk and Drew Nussbaum, Policy offers two levels of charm and class in a hip and inviting environment. Redefined with an explosion of broiled, marinated and sautéed perspectives. 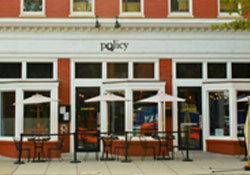 Policy’s kitchen is introducing cutting edge American cuisine to this hip and unique restaurant.